As of Plane 3.0.4 you can use automatic terrain following for fixed wing aircraft if you have an autopilot board with local storage (such as the Pixhawk). This page explains how terrain following works, how to enable it and what its limitations are. If using Copter, see Copter specific terrain following instructions here. Terrain following works by maintaining a terrain database on the microSD card on the autopilot which gives the terrain height in meters above sea level for a grid of geographic locations. On the Pixhawk this database is stored in the APM\TERRAIN directory on the microSD card. The database is populated automatically by the autopilot requesting terrain data from the ground station over a MAVLink telemetry link. This can happen either during flight planning when the autopilot is connected over USB, or during flight when connected over a radio link. 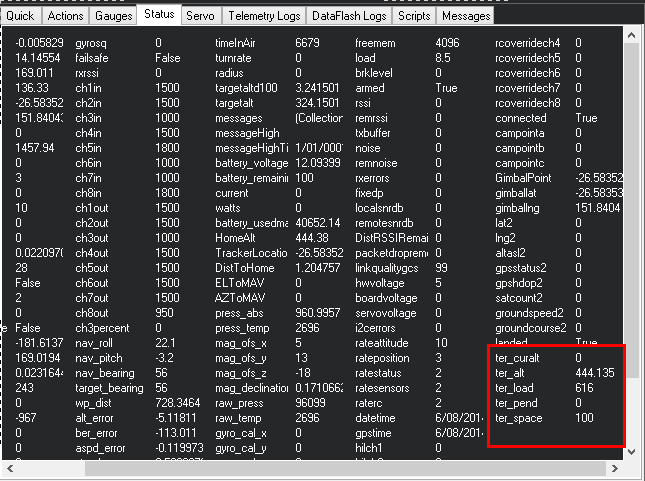 Once the terrain data is sent from the GCS to the autopilot it is stored on the microSD card so that it is available even when the GCS is not connected. This makes it possible for the autopilot to use terrain data to perform a terrain following RTL (Return To Launch) even when it is not able to talk to the ground station. During flight the ArduPilot code automatically pages in the needed terrain data from the microSD card into memory as the aircraft approaches a new area. It maintains an area of about 7km by 8km in memory if the default terrain grid spacing is used. In addition to any terrain data for the immediate vicinity of the aircraft, ArduPilot also asks the ground station for terrain data for any mission waypoints which are loaded, and for any rally points which are loaded. This ensures that terrain data is available on the microSD card for a whole mission even if the GCS becomes unavailable. Use of terrain following in RTL, LOITER, CRUISE, FBWB and GUIDED modes is controlled by the TERRAIN_FOLLOW parameter. That parameter defaults to off, so no terrain following will be used in those modes. Set TERRAIN_FOLLOW to 1 to enable terrain following in those modes. Use of terrain following in AUTO missions is controlled on a waypoint by waypoint basis using the reference frame of the waypoint. Normal (non terrain following) waypoints have a “Relative” reference frame, and altitudes are specified relative to the home location. Terrain following waypoints have a “Terrain” reference frame, and altitudes are relative to the ground level given in the terrain database. Safe RTL. Being able to come over a hill rather than trying to fly through it when you enter RTL in a hilly area is very useful! The ground station is responsible for providing the raw terrain data which is sent to the aircraft via MAVLink. Right now only MissionPlanner (version 1.3.9 or later) and MAVProxy support the required TERRAIN_DATA and TERRAIN_REQUEST messages needed for terrain following support. If you are using a different ground station then to load terrain data you will need to connect using one of the two support ground stations to allow ArduPilot to load terrain data onto your board. It typically takes around 2 minutes to load all the terrain data for a mission. Once it is loaded it is saved permanently on the microSD card. Both MissionPlanner and MAVProxy support the global SRTM database for terrain data. That database has a global grid spacing of 3 arc-seconds (around 100 meters), but has a smaller grid spacing in some parts of the world (around 30 meters in the US). Support for other terrain databases can be added by extending the ground station code without changes to the ArduPilot code. The ArduPilot terrain code has a user settable parameter called TERRAIN_SPACING which controls the grid spacing which is used for requests for terrain data from the aircraft to the ground station. The default TERRAIN_SPACING is 100 meters, but users may set a different grid spacing for specialist applications. Note that the amount of terrain data kept in memory is directly related to the grid spacing. If you decrease the TERRAIN_SPACING by a factor of 2 then the amount of terrain area kept in memory is reduced by a factor of 4. It is recommended that you use a TERRAIN_SPACING of at least 30 meters to prevent the aircraft running off the side of a grid in flight and not having data available. If the ground station does not have terrain data available at the resolution requested by the aircraft then the ground station will interpolate as necessary to provide the requested grid size. The accuracy of the SRTM database varies over the surface of the earth. Typical accuracy is around 10 to 20 meters, although some areas are worse. This makes terrain following suitable for aircraft that are flying at altitudes of 60 meters or more. Using terrain data for low flights is not recommended. When the autopilot has finished loading terrain data you should see “ter_pend” goes to zero and the current terrain altitude in meters showing up in “ter_alt”. The “ter_pend” value is the number of terrain blocks that the autopilot is waiting to load from the ground station. 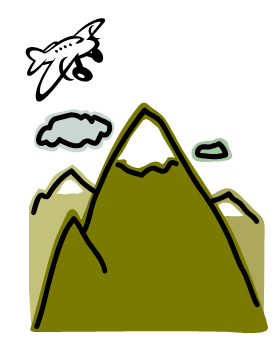 The terrain following code “looks ahead” of the current position along the flight path to try to ensure that the aircraft climbs soon enough to avoid upcoming terrain. The amount of lookahead is controlled by the TERRAIN_LOOKAHD parameter, which defaults to 2000 meters. The lookahead is also limited by the distance to the next waypoint in AUTO mode, so you need to ensure that you don’t have any legs of your mission which include climb rates your aircraft cannot achieve. The climb rate used in the terrain look ahead is based on the TECS_MAX_CLIMB parameter, combined with your current ground speed.